"We cannot solve the problems that we have created with the same thinking that created them"
While you read this, a string of events is happening across the globe which directly affects you, your children and also your finances. The global average temperature is very slowly, but surely, rising, necessitating the need for air conditioners in more places, and major climate-related lifestyle changes. More critically, this elevated temperature starts to melt the polar ice caps threatening countries like Myanmar (Burma) & Sri Lanka's very existence. They may submerge along with many coast-lines and thousands of small islands across the globe. Every day we lose one lakh acres of tropical rainforests in one or other part of the globe which in turn leads to more Carbon Dioxide in the atmosphere and less of the life-supporting Oxygen. Up above the sky, the chain reaction set in by the chloroflourocarbons are eating up the Ozone layer, permitting more and more ultraviolet rays to strike the earth which in turn can cause mutations on the DNA molecule. Among the variety of factors listed above, we at Inheritance India, ask you to take a closer look at Forests. You will know the reason why as the story unfolds on our website. While you take this web-journey you will see how all these events are inter-connected among themselves and also with your life, your family, and your financial and physical well-being. About 50% of all species live in Tropical Rain Forests, which covers 2% of earth's land surface. These prolific wombs of life hold the largest biomass of any terrestrial habitat. By far the planet's richest environment, aside from regional climatic fluctuations, they have remained basically unchanged since prehistoric times. They have served as the planet's major gene pool, constantly evolving new plants, micro-organisms, insects, fish, birds and mammals to fill gaps in an ever changing world. 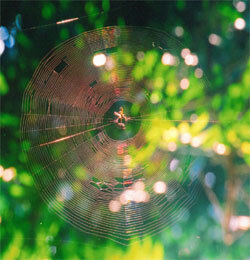 Diversity and interdependence gives strength to the bonds that weave the web of life. These forests have developed an enormously efficient ecosystem over 50 million years, and we are losing their precious life supporting systems at the rate of over 100,000 acres A DAY. The system is fragile because the topsoil is shallow and the lush growth is largely water, disguising a low level of fertility. It is the dense tree cover that keeps the system going. Without it the soil is easily washed away, leaving the land barren, and often unfit for agriculture. What do we lose? We wipe out, forever, the end product of millennia of evolution. We prevent the study of thousands of undescribed plants and animals which may just hold the remedies and cures that humanity has been seeking for ages. We endanger the survival of the remaining cultural groups trying to live there. We exterminate the best carbon dioxide absorbers on the planet, thereby also reducing the available oxygen. 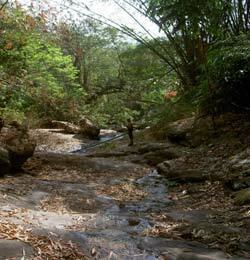 In historical times, tropical moist forests clothed about 25,000,000 sq. km. of the humid equatorial belt lying between the Tropic of Cancer and the Tropic of Capricorn (the Tropics). Since 1950, 54% has been removed at an accelerating pace. Today approximately 11,517,320 sq kms remain, covering 6% of the land surface. Of this, 170,320 sq. km. 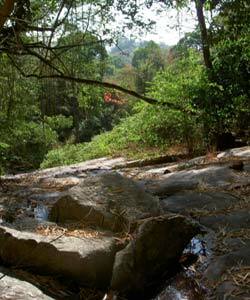 of tropical moist forest is found in India, which accounts for 1.48% of the world total. Only 5.3% of all land in India is covered by tropical moist forests! is a complex web linking animals, plants and other life forms in any particular environment, whether it's a garden pond or the whole biosphere. Everything hangs together in the ecosystem-if we alter one part, we alter the others - sooner or later. Humans are only one factor in the ecosystem, but, unfortunately, we don't quite see it that way. We tend to set ourselves apart and call all the other factors or species "natural resources" for us to exploit. We have now learnt - or have we?? - That human survival depends on preserving the ecosystem. 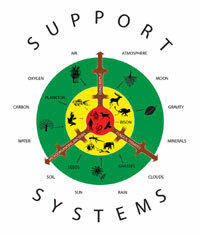 The ecosystem can do without us but we can't do without the ecosystem - as long as we live on planet Earth. The amount of fresh water available for human use directly is less than 1% of all the water on the planet. India records the second largest annual rainfall in the world, but we still face a water shortage!! Web Of Life(Click to Enlarge.) The food chain is a complex, balance of numbers game. In this simplified example it is easy to see that the cycle goes from abundance to rarity. If, for example, the tiger becomes extinct, the deer population would explode, who in turn would overgraze the grasslands, which would lead to soil erosion and the ultimate extinction of the eco-system. There are an infinite number of such examples, each interconnected and interdependent which make up the 'web of life'. The millions of different kinds of living beings are connected by the energy of Life. Even what we consider 'non-living'(like air, water, soil, the elements, the sun) play a vital role in allowing life to happen on our planet. When we tamper with the threads in the web, we are unable to see beyond the next few links - or we are not looking! - and predict accurately how a particular action would affect us and our environment and us in the long run. Biological diversity refers to the entire range of life forms on earth. These include millions of plants, animals and micro-organisms, the genes they contain and the intricate ecosystems of which they are a part. Genetic diversity: This is the diversity of the basic units of hereditary information (genes) within a species, which are passed down the generations. Species diversity: Species is the unit used to classify the millions of life forms on earth. It is measured as the total number of species in a defined area. 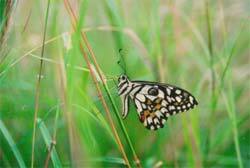 Species biodiversity is the most commonly used level for describing the biodiversity of countries. Ecosystem diversity: An ecosystem is a set of life forms (plants, animals and micro-organisms) interacting with one another and with the non-living elements (air, soil, water, minerals etc.) of their environment. EB is therefore the diversity of habitats. India has tremendous diversity of all the three kinds. It contains over 5% of the world's biodiversity on 2% of the earth's surface. The number of plant species in India is estimated to be over 45,000 representing about 7% of the world's flora. These include over 15,000 flowering plants of which 4,900 species are endemic to the country. India's faunal wealth is equally rich. The total no. of animal species is estimated at 81,000, representing about 6.4% of the world's fauna. These include about 57,000 insects, 2,546 fish, 204 amphibians, 428 reptiles, 1,228 birds and 372 mammals. Conservation International defines biodiversity as the sum total of all life on Earth, the wealth of species, ecosystems, and ecological processes that makes our planet what it is-a crucible of life. Biodiversity also plays a key role in our daily existence in that all of our food is originally derived from wild plants and as much as 25% of all our medicines originated in the wild. A Biodiversity Hotspot is defined as an area of exceptional plant, animal and microbe wealth that is under threat. There are 25 global Biodiversity Hotspots, ranging from the Amazon basin, African rainforests, south east Asia, and two spots in India: The eastern Himalayan region, and the Western Ghats. The Western Ghats stretching 1,440 km. from the Tapti river north of Mumbai, to the southern tip at Kanyakumari run parallel to the west coast of India and are among the country's most important natural assets. This region is blessed with an abundance of life forms found nowhere else on earth. The endemics include 7 mammals, 16 birds, 84 amphibians, and an amazing 1600 flowering plants. There are numerous other life forms which may have escaped our attention. The fact that these biologically rich areas are threatened by human activities, like mining, habitat loss due to agriculture and development projects and poaching, places the area in the hotspot category. Much has been done to protect this ecologically fragile area by courageous individuals to save and protect it. WE, AT INHERITANCE INDIA, are committed to working towards reversing the current trends from destructive, lop sided and self centred, to balanced and respectful. Forests harbour a huge variety of creatures each of them interlinked in complex and interesting ways. It is by observing and marvelling at these relationships that we get glimpses into the secrets of the natural world and of ourselves. One of the two locations in Kerala where the Inheritance India project is sited is a 120 acre wild coffee plantation purchased by us lying at the fringes of Wildlife Sanctuary. The altitude varies from 2000-4000ft.The densely forested valley, very similar to a Shola forest, faces east, and is bordered on the north and south by grasslands. A ridge on top of the valley extends on the south side to the highest peak in the area. The canopy is largely intact and the average age of the trees is estimated to be around 30-40 years. In the past it was a proper coffee, cardamom and pepper plantation but since we have taken over, the management policy and focus has changed from commercial crops to nurturing nature. There has been a concerted and ongoing effort to remove weeds (Lantana camera) and promote natural regeneration. This has resulted in a two fold benefit.Since no chemicals have been used, either as pesticides or fertilisers, for a few years now, as well as the topography of the valley, the crops could be considered organic. The other 'benefit', as we see it, is that the animals seem to have found a haven, and more diversity is being seen more often. This increase in diversity has also added to our responsibility. With the active involvement of the local people and the Forest Department, we are now in the process of establishing specialized habitats which would increase the number of ecotones in the area and thereby ensuring that the animals are safe and comfortable. Also, scientific studies to assess the population status and conservation requirements of all major groups of organisms are underway. The first such attempt which focused on birds was done in collaboration with the Wildlife Biology Department of Aligarh Muslim University. Resulting from this there now exists a check-list of 108 species many of which are endemic to the Western Ghats. This coming together of scientists, researchers, conservationists, forest officials and local people is the unique strength of our conservation practice. Based on true scientific principles, protocols are now being prepared for the estimation, valuation and conservation of the rich biodiversity we hold.